Christians often wonder whether it is worth their time to read and study the narratives about God’s instructions for the tabernacle in the second half of the book of Exodus. The answer, according to Daniel R. Hyde, is an emphatic yes. 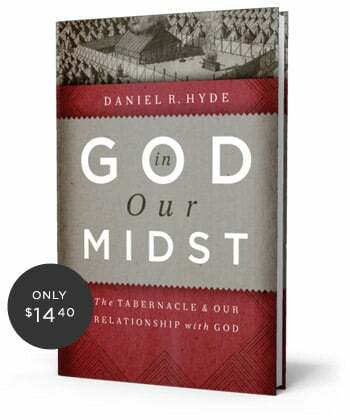 In God in Our Midst: The Tabernacle and Our Relationship with God, Hyde shows that the tabernacle narratives have much to teach us about God Himself, about sin, about redemption in Christ, and about how we are to live for God today. Above all, by interpreting these narratives according to solid hermeneutical principles and New Testament revelation, Hyde shows that these passages reveal Christ. Ultimately, Hyde says, it is good to read the tabernacle narratives because they are part of our family history. We need to read and meditate on that history because we have the same God, the God who told His old covenant, “I will dwell in your midst,” and who tells us that Christians are the true tabernacle, the dwelling place of God under the new covenant (Eph. 2:22). Buy it for $18.00 $14.40 from ReformationTrust.com.